Hey, it's the Friday before the Friday before Memorial Day! That means we've officially switched over to our summertime temperature grid on-air, specially featuring Jersey Shore towns. It also means the 2018 Shore Report makes its grand debut! We'll update it daily through the end of September. Unfortunately, the weather won't be very "beachy" this weekend. A stationary front is still parked on top of New Jersey, with abundant tropical moisture flowing into our atmosphere. That means our rainfall will intensify and become quite steady for much of Friday. In fact, as of this writing, there's a batch of heavy rain lifting out of Delaware and Maryland, aiming for South Jersey. It's important to note that not everyone will get soaked on Friday. The trajectory of this rain and its associated storm system, according to model consensus, will track over mainly southern New Jersey. The area south of Interstate 195, plus Mercer and Monmouth counties, is facing a probable washout for much of Friday. North of that point, however, it looks like the rain will be lighter and more scattered. In fact, North Jersey actually looks mostly dry during the Friday daytime hours. So let's talk about the flooding potential. It appears the National Weather Service's Flood Watch is very well-placed, encompassing all of southern, all of central, and part of northwestern New Jersey. It is now in effect through 6 p.m. Saturday for the following 14 counties: Atlantic, Burlington, Camden, Cape May, Cumberland, Gloucester, Hunterdon, Mercer, Middlesex, Monmouth, Ocean, Salem, Somerset, and Warren. Indeed, the ground is getting mighty saturated now. During periods of moderate to heavy rain, flooding may occur suddenly in places with poor drainage or low-lying areas. In addition, our rivers, streams, and creeks will continue to swell due to both rainfall and runoff. By Friday evening, the track of the rain looks to shift northward. So most of the state is apt to get wet again through Friday night. Overnight lows will dip just a few degrees into the lower 50s. The wet weather continues for the weekend too. Showers and thunderstorms are expected for most of Saturday throughout the Garden State. 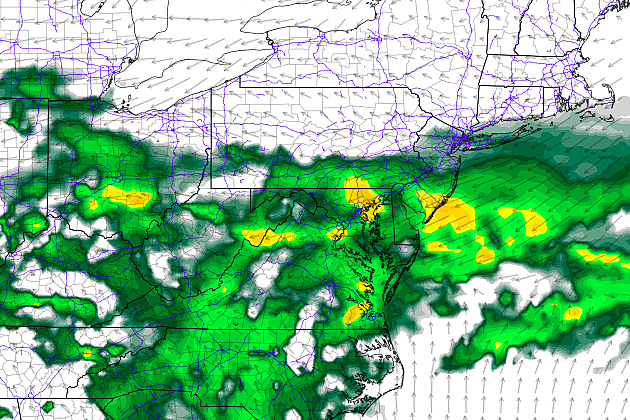 We might catch a break in the rainfall late-day — that's late afternoon through early evening — especially the further south you are. A peek of sun would push our high temp to about 70 degrees. Otherwise, we won't break 60. All week long, I've been optimistic about Sunday, but I can't deny that forecast models have been trending a bit more unsettled for the second half of the weekend too. I think we can hold out hope that Sunday will be a mostly dry day, but at least a few showers and maybe even a thunderstorm are possible too. Given some breaks of sunshine, thermometers should spike to about 80 degrees. Even though we'll start drying out on Sunday, another front will stall on top of New Jersey. That will potentially keep our weather unsettled through the first half of next week, although I do not expect widespread washouts and deluges again. The second front does complicate the forecast quite a bit — I don't think we have tremendous clarity on how the Monday-Tuesday-Wednesday forecast is going to play out. It looks unsettled for sure. And warm, with highs around the upper 70s to lower 80s. Additionally, it's clear that there will be one more "final" cold front, that will at long last kicks this extended rainy, cloudy, cool pattern to the curb. But models have been wishy-washy about when that front arrives. As long as that happens Tuesday or Wednesday, I still believe we'll get a period of clear, dry, pleasant weather through the start of the Memorial Day Weekend.